Placewinners in the first-ever CSMA ONE DAY Winter Coverage Challenge include 7 schools among 18 total entries in the various contest categories. The contest challenged student media programs to focus on one day in the life of their school community – Friday, Feb. 9, 2018 – and to share their reporting on that day. Taken together, the coverage shows a fascinating picture of a typical school day in Colorado. Contest rules were left wide open, and different student media chose very different ways to cover the day. Some focused on a big event on campus, some took us into their communities, and some mixed news and opinion. Taken together, it’s a fun trip. 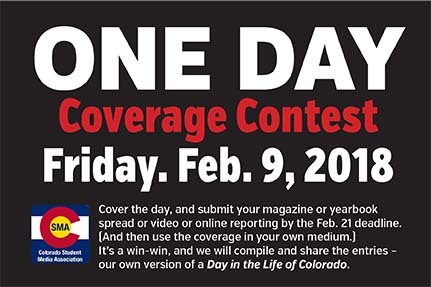 Entries were submitted online, and judges included Jim Rodenbush, adviser to The Collegian, and Greg Luft, chair of the Department of Journalism and Mass Communication, both at Colorado State University. All place winners receive an award certificate, plus all first place winners had a $50 donation in their name given to the Student Press Law Center. Olympic from Kayla McGilvray on Vimeo.